Murmurations: Emergence, Equity and Education, the Public Knowledge Project’s Open Journal Systems, and Hypothesis are pleased to announce the launch of in-line annotation as part of the journal’s mission to support emergence and transformation in education. 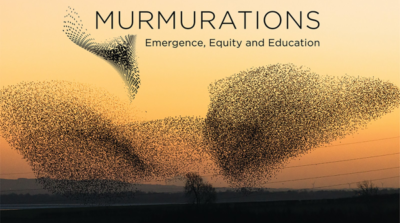 A fully open-access publication, Murmurations now offers open peer review in a journal-branded annotation layer to share the creative process around submissions. Hypothesis’ open source annotation technology is designed for collaboration and community feedback. 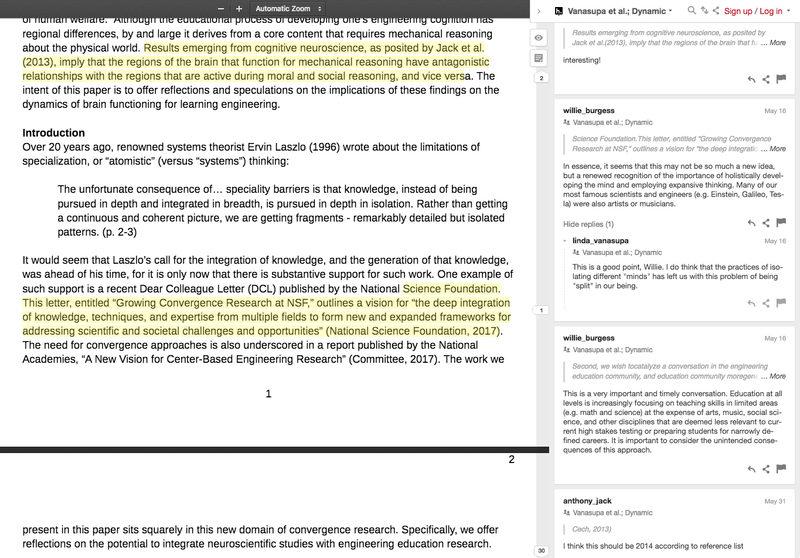 Because it enables in-line annotation and responses on top of online documents, Hypothesis is useful for many workflows, including peer review. A Murmurations restricted group offers content creators the opportunity to engage with reflectors and facilitators from the journal team. The result is a world-readable annotation layer on top of the version of record. Hosted on the Public Knowledge Project’s Open Journal Systems platform, Murmurations staff worked with teams at PKP/OJS and Hypothesis to bring this group to fruition. “A unique feature of the Hypothesis/PKP collaboration is the transparent dialogue amongst the team of reflectors prior to publication. Because of this, the emergence of the creators’ piece can be witnessed — a phenomenon that we expect to fundamentally change the nature of the dialogue in what would normally be a blind review,” said Linda Vanasupa, Catalyst Board Member and Journal Facilitator. Hypothesis Publisher Groups functionality was released earlier this year to enable publishers to create a branded and moderated annotation experiences on their sites. Publishers can choose an Open Group, a world-readable and world-writeable layer in which anyone can participate, or a Restricted Group, dedicated to specific participants to meet a particular need, such as peer review, content updates, additional author information, and more. Hypothesis can be customized to fit publisher sites and can connect to existing publisher accounts, if needed. Full analytics are available, and our robust API enables full access for repurposing of data. Created as a nonprofit, Hypothesis believes that publishers and other group sponsors should be fully in control of their data. Based on the W3C web annotation standard approved in 2017, Hypothesis is dedicated to creating a future based on open interoperable annotation to benefit researcher notetaking and collaboration, teaching and learning, publishing, and journalism and fact-checking. Murmurations has come into existence through research activities made possible in part by a grant from the National Science Foundation (EEC1025265). Murmurations affords publication of artifacts of importance to those involved in systems of education. Our dialectic journal aims to allow open access to insights and information that are often not visible in typical peer review processes; in doing so our goal is to see how we participate in dynamics that often contribute to problems within the current system of education. We seek grounded works that inform beneficent changes in educational systems or address systemic issues in education. Murmurations accepts original works that are underrepresented in academic publishing. The Public Knowledge Project (PKP) was established in 1998 at the University of British Columbia. Since that time PKP has expanded and evolved into an international and virtual operation with two institutional anchors at Stanford University and Simon Fraser University Library. Open Journal Systems (OJS) is open source software made freely available to journals worldwide for the purpose of making open access publishing a viable option for more journals, as open access can increase a journal’s readership as well as its contribution to the public good on a global scale.